Log all actions performed in store backend by admin users, view log history on the grid and keep the log records for as long as you need. View login activity and block malicious login attempts. Know what have been done in your store admin panel and by whom. The module is fully compatible with Advanced Permissions and perfectly supplements its functionality. With Advanced Permissions you'll be able to effectively manage your staff by separating category management and limiting the access by store-view and website. Choose whether to keep action history for all admins or just specific users. You can also easily filter all login attempts by date. You can preview changes details right from the grid with small preview window as well as go to the page with more thorough information. Why is keeping admin logs important and how does this relate to hacking? See here. In the default mode multiple users can run one account at the same time. When you switch on this option, you secure the session making it available just for one backend user. When the role of an admin user is changed, you'll be able to see the changes in the admin actions tab. 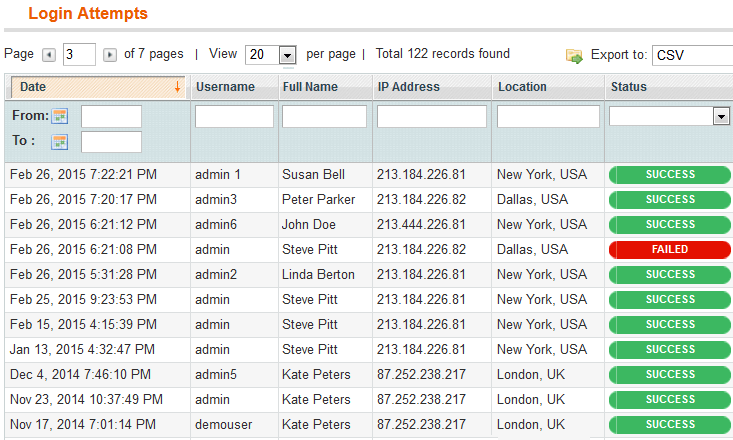 These data will be available not only on the admin log details page, but in the preview mode as well. All changes of related, cross sell and upsell products are now logged. The module also tracks edits of categories and websites; you can view the history of changes whenever you need. More importantly, it's possible to cancel edits and restore the previous settings any time. If one of admins for some reasons made incorrect changes in your store, you can restore them nearly in a trice. Learn how to manage your employees' work effectively to reduce mistakes. Let’s say you allow 3 attempts for users to fill in the right password. If all the three attempts are wrong, the user is denied access to admin panel page. It’s especially useful to defeat robot attacks. Use GeoIP support to determine country and city from where admin has logged in. To enable this option please follow the instructions. When there are several login attempts during a short time you receive email notification of these break-in faults. See how to gain the highest level of security in your Magento. Easily export login attempts information in CSV and XML format. You can get email notification if a user successfully logged in from unusual country. The email contains the information about user name, full name, IP and a country where the login attempt was made. You have a great opportunity to enhance your website monitoring. Assign permissions to users for editing certain products, categories, Magento store-views and websites. With the help of Advanced Permissions extension one can easily manage online stores with rich item catalogs as well as multivendor and maltilanguage stores. Let everyone play their unique roles to make the work of the whole store even more productive. Use a Live Stream of customers actions to stimulate sales. Show informative AJAX notifications about the actions other customers take in your store, e.g. ‘Product X was ordered by 3 people’, etc. Take advantage of the sense of urgency and competition, generated by constant activities of other people. If two or more admin users are editing one product simultaneously, the chances are high that data loss can occur. Prevent it with Edit Lock module that locks editing of Magento products, customers, etc. if the item is already being edited by somebody. Try Two-Factor Authentication for logging into your Magento. Using both, a good password and a security code will let you protect your store from key loggers, network data sniffing, unsecured wifi connections, and other threats. Does this module also log changes that admin users make to orders? Yes, Magento logs who made change, the extension will track the sales orders changes performed by an admin user. Does it log regular users or just admins? This module logs only admins' actions. Magento admin user log ins and outs and all the modifications applied to your store are gathered and stored by the extension. Can I choose who will be able to view changes history? Yes, with the use of the extension, you can choose who will be able to see changes history. While setting up admin actions log archive you may include there action history on all admins or just specified ones. To see the screenshot read on. Does this Admin Actions Log show changes after importing products from a third-party CRM system? If everything is imported correctly and Magento reflects those changes, then our module will also show them. This allowed me to find and block possible intruders to the site in a timely manner. This extension allows a detailed analysis of all activities on our website, including comments. I especially appreciate the possibility to view history of actions; this feature visibly improves productivity of store managers. More than recommended! Our Magento is a bit out of date and every time I purchase new extension, I’m worried about how it will work. This time the plugin was simple to install, I didn’t even ask anybody for help. We still needed some code changes and minor adjustments. But they were absolutely painless, devs coped with all of it in just a day. Cool! It’s a valuable plugin. It happens that managers make errors and demand help of the support specialist of our store. This is when the extension comes to use, it allows tracking when and where the mistake was made and cancel the unnecessary changes immediately. It saves a lot of time and nerves. Besides, with the help of this module it’s easy to inform customers about the status of their orders. I’m impressed by the level of support we have received. Guys are really professional and helpful! This addon helps us run our business by allowing to control complex sequence of actions made on store backend. This module keeps all the log details on the grid and allows access to this info. It gave us the ability to quickly react to changes in orders or new comments. Thus with one tool we’ve achieved two goals: we speeded up customer service and started to follow activities of our staff really closely. Both of these things are very important for business, so I’m really satisfied with the extension. You know, I was actually searching for some tool to prevent hacking attacks. Not that it’s a thing that can happen to your store every day but when it does, it could cause all kinds of problems. It’s always better to be safe and just avoid potential trouble. I was lucky to find this Admin Actions plugin. It covers all my needs with blocking unsuccessful login attempts and tracking GeoIps. And it also allows me to keep an eye to all activities in the backend. Brilliant I say! I bought the module with installation service, so I can’t say whether it is hard to configure or not, but I can assure, that it works like charm. A stagier has joined our team recently, and that’s when we felt all the importance of tracking each little change made on the backend. Admin history log really helps planning the work. Analyzing history data is helpful for making a suitable individual plan for each employee. I purchased the extension with installation service and everything was done and ready overnight. Good work! I support several online shops and this module is very useful for me cause store admins often make mistakes and beak something. Thanks to the mod I can track when, where and by whom a mistake was made and quickly fix it. The plugin provides a comprehensive way to understand who did what, trace the source of problems and misunderstandings. Besides it can motivate store administrators to work effectively. But nothing is perfect. We installed the plugin without any help, the process did not seem complicated; but the extension simply did not work, even though it was configured correctly. We turned for Amasty support for help, and the guys figured that our customized Magento theme was causing the problem. Now it all works fine. 4 stars ‘cause the ext is a bit pricey, should be more affordable. Nous avons besoin de controler les modifications apportées à nos produits et les ordres. Nous avons plusieurs personnes qui travaillent sur la mise à jour et l'édition de produits et les ordres, ce qui nous permet de suivre les changements détaillés par chaque usager. Nous utilisons cette extension avec Magento Community 1.9 et il fonctionne très bien. Easy to use, very helpful plugin. With the help of tech support we managed to install it within a few minutes, and then configured everything according the manual instruction - nothing terribly difficult at all. Hope, everything will be running well, at the moment this extension fulfills all our requirements to admin management tool. We've been running the extension for 6 months already, and haven't found any bugs or inaccuracies so far (even though we tried hard ;) So, I'd suggested to install this tool to everyone who has more than one store admin and especially to those who have distant employees as the tool perfectly tracks locations and ip addresses. I'd recommended this log tracker to big stores where more than 2 admin managers work. As for me, it appeared to be too feature rich, as I don't need the info about admin'd ID or location, I just need to keep my store items properly updated and keep everything in its places. Anyway, huge store owners will definitely highly appreciate it. I'm totally satisfied with extension's quality as well as with the way this developer treats their customers. I gave only four stars to the app just because I had to wait about a week before support managers replied to my ticket. Yes, there were national holidays or something like that, but I do believe that good companies still have at least one support person in charge for extra urgent cases. The app itself works fine. Installed within seconds, configured within a couple of hours - got a spotlessly working program! You know, This is maybe the first magento app that was so easy to integrate into my store. Crack on, Amasty! This is really the ext I can’t live without. Due to this module all chaos was eliminated. All the work is clearly structured now: no overlaps, no missed tasks. When running the business I prefer to know about all the changes in real time 24/7, so e-mail notifications about all changes and user roles switches work really great for me. Implementing Geo IP was a tough task, we just couldn’t make it. Support managers worked it all out for us in just a few hours. All in all the extension itself works as described and the support department is quite helpful. This extension can block admin incorrect login attempts, wich is a good security point. It can list and undo every admin action, wich is excellent and the main feature. But most important, and that's why we use it for all of our clients : it clearly points responsibility when a mistake is done, and we no longer hear, as developer, "it was working then it broke, we don't know why, you made a bug". Thanks to the admin log by Amasty now we can track all necessary actions by our store admins (the changes on product pages in particular). It's much easier to find out when and where the mistake takes place when you have a handy actions grid that allows filtering by actions. The installation passed seamlessly and everything runs fine. Thank you, Amasty! For some reason the functionality to track changes made by admin users (not to mention cancelling those changes) is completely missed in the default magento. It’s a serious flaw, and we needed to fill the gap somehow. This addon is just what we were searching for, it works smoothly and doesn’t cause any issues. For me GeoIP and failed login attempts feature were just additional at first, I didn’t think they are important. After thinking about it a bit more I’d say that it is great shield from hacking attempts. Now we don’t need a separate tool to protect our store, and that’s great. A+ for killing to birds with one stone. Good tool. It saves you working hours and nerves. After using the module for just a month I can’t even imagine how I managed to keep an eye on our seven admins without using special tools. Amasty always knows what merchants need most, they incarnate it all in their extensions. Very helpful extension if you have plenty employees working on the backend of your magento store. This plugin allows you to check literally every action of every admin user. It’s a common situation when modifications are made by mistake but now the operators can’t endlessly blame each other. All actions are tracked, so business-owners always know for sure who actually made the unwanted changes. The possibility to quickly undo all wrong actions is just a magic wand to put things on the right track again! The staff actually becomes more disciplined and effective, knowing that their actions are recorded in real time. Now we are thinking about implementing a reliable KPI system with benefits and rewards for the most hardworking managers. I recommend this infallible eye plugin without any doubt! The ext allows tracing the source of some management and administration problems. Really necessary tool for any store with more than one person working at the backend. At the beginning we had a few issues due to our heavily customized magento. Tech support was very helpful though. They did an excellent job and got us up and running fast. The app itself is not bad and has a bunch of useful tools, but its a bit too pricey. Yep, you pay for good tech support and for the brand, but now I'd rather looked for something cheaper with the same functionality. No offence, guys. I tried 2 other admin log extensions before going with Amasty, and they all conflicted with M2EPro. it was an endless headache. Amasty was the only extension that did not conflict at all as I guess it creates the logs in a different manner. I hadn't tried this extension initially because it didn't allow you to search for products, customers, etc., which is a pretty essential function. I asked the developers if they could customize for this feature, and they did it super fast and very inexpensively. Definitely first class support. I hope they add this function default in the future, but if not I would ask. This extension worked great until putting in a few other extensions, which seemed to break the tracking. However, a quick support ticket into Amasty and within less than 12 hours they released an update that fixed the issues. This is a great extension and Amasty is a great company. I'm following all new extensions, made by Amasty. This one was really waited for. I have 30000 products in my store and lots of managers admin it, so the solution is absolutely necessary. Waited so long for a solution like this! Excellent tool! Thank you Amasty! There are 10 manages working on the products in our store, and we are finally able to track all the activities. It's a really great tool! – Set "0" for unlimited" for "Automatically Clear Action Logs After, Days". – Fixed error when entering admin panel after "Log Out All Other Sessions"
– Improved compatibility with other modules.